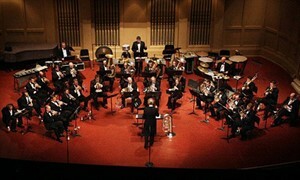 Often called the “Boston Pops – In Brass,” the 28 piece brass band brings to Lebanon the music of Hollywood such as: Ben Hur, Indiana Jones, Saving Private Ryan, Titanic, Independence Day, Slumdog Millionaire, and more! In1981 a musical renaissance took place in Pittsburgh, PA… it was an evening that brought about the revival of the grassroots tradition of the American brass band. Now 38 years later, British conductor, James Gourlay continues the legacy in what promises to be a Brasstacular concert entitled “Blockbusters”!